I thought we’d be able to make it until the end of the school year without my 4 1/2 year old son needing new sneakers, but you can’t contain little feet! Stride Rite came to my rescue with their awesome Nickelodeon Slimers Chromamorphosis Sneakers (was $49, on sale for $39.99 ). These playful and durable grey, silver and black sneakers are made of leather and mesh and have design accents with liquid crystal color shifting technology – which means the colors change when you walk or touch them. They look great and I know that the shoe is quality because they’re from Stride Rite. The hook and loop closure is convenient for little hands to on/off, which my 4 1/2 year old loves to do himself. We love the fit and the flexible outsole! 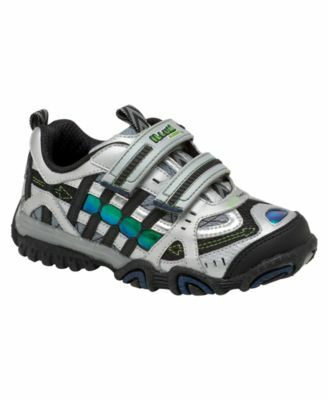 Available in boy (size 7 to 12) and big boy sizes (12.5 to 5). Comes in a medium or wide width. Now is also a great time to stock up on water shoes or sandals for summer — we like the Gus ($38) or the Sperry Top-Sider Boys Lagoon ($34). The Gus offers a Leather upper, Hook-and-loop closure for easy on/off , have fast drying uppers for in and out of water play and have an antimicrobial footbed! The Lagoon offers a hook-and-loop closure, a 30% recycled rubber outsole and a leather and neoprene upper to keep feet dry. Stride Rite is offering free shipping if you order two pairs or more (any shoes, sneakers or sandals). Thank you to Stride Rite for providing a sample pair. « Juno Baby DVDs and CDs: Beautiful, Original Music That Gives Back!